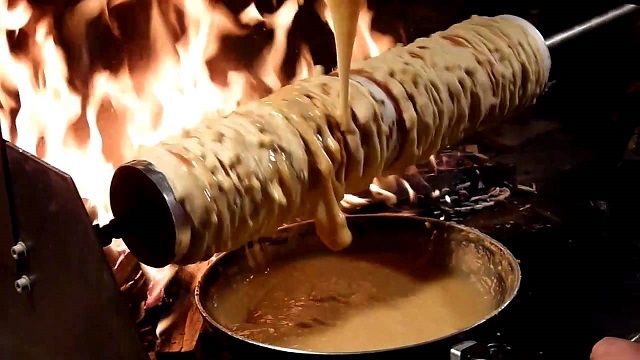 In my taxonomy, any cake baked on a turning spit is a spit cake or rotisserie cake.There are two groups within the rotisserie cake family, separated by baking method: tree cakes and chimney cakes. 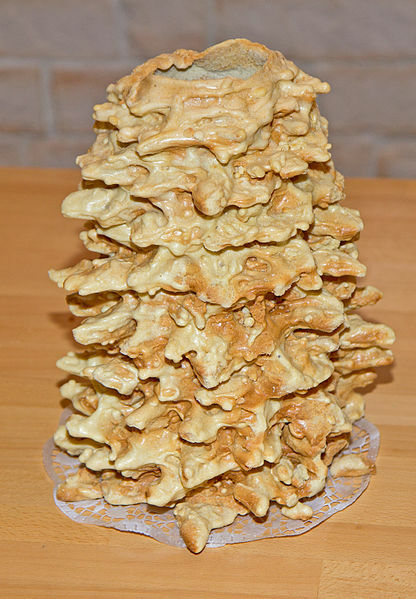 Tree cakes are the result of applying cake batter to a spit and building upon previous layers. 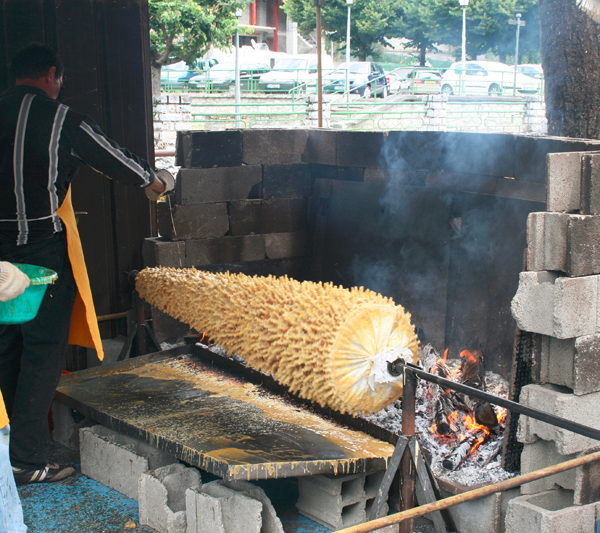 Chimney cakes are made by preparing a thick dough that is rolled out and wrapped on the spit and baked in one go. Both cake groups have long historical precedents and produce enchanting baked goods. Of course, there is plenty of room for variation within each of these approaches, and that is how we end up with the great diversity of rotisserie cakes that you and I can enjoy. I shall outline some cakes below. It is not an exhaustive list, though I wish it could be. Tree cakes are so named because resemble trees in some way or another. Because of the incremental way that the cakes grow, you can observe rings (much like the rings of a tree trunk) in many tree cakes. Some also have spikes or branches, furthering the arboreal analogy. 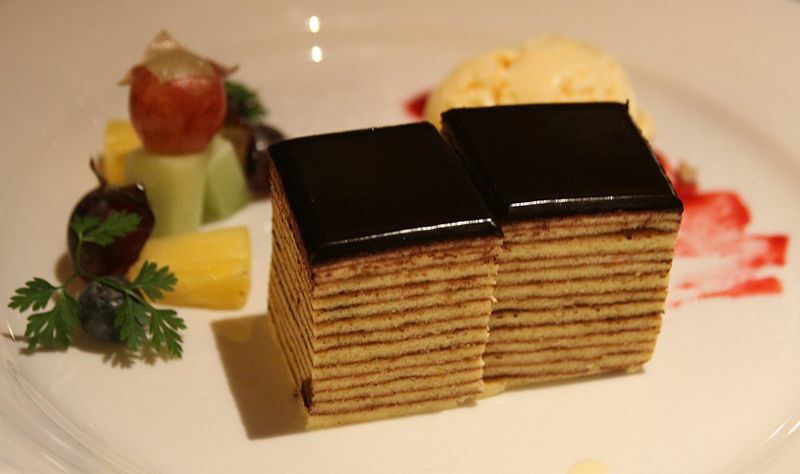 Likely the most well-known spit cake, baumkuchen (German for "tree cake") is made with distinct, discrete layers. It's a popular wintertime treat in Germany and is also very common year-round in Japanese cafés. Baumkuchen is the spitcake that most closely resembles a tree trunk when cut open. Many bakers choose to "groom" the layers with a special tool to create a smooth or wavy exterior. Without this, the cake's exterior takes on a profile with irregular bulges (a style that is growing in popularity once again). Call it what you will, this variant from Poland and Lithuania is a thinner, drier tree cake made on a tapered wooden spit. During baking, the cake is spun very quickly to produce the irregular spikes. 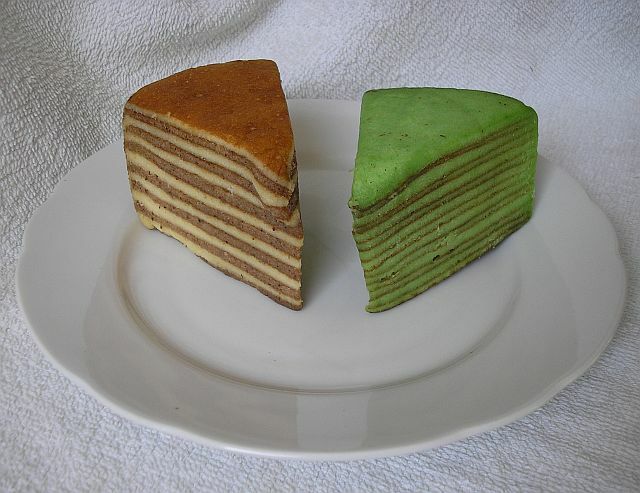 Batter is dribbled onto the cake more-or-less constantly, so layers are not as well-defined as in baumkuchen. This cake is frequently seen at weddings. I really don't know what caused tree cakes to show up in rural pockets of southern France. But sure enough, there they are. 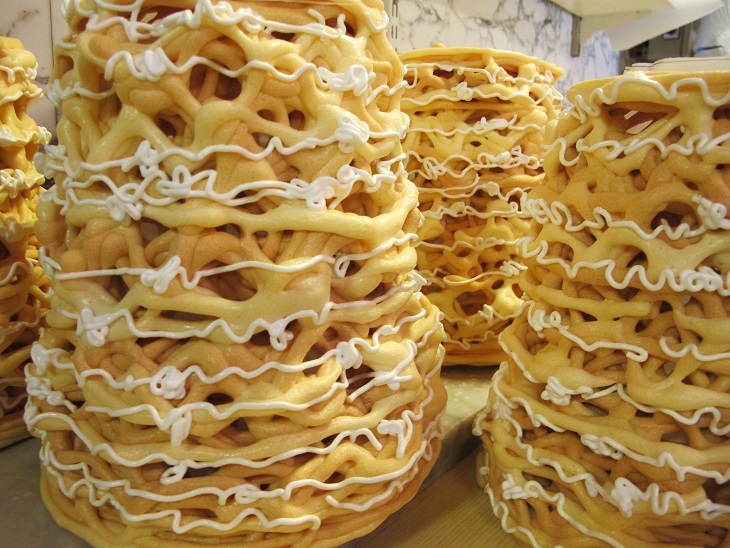 Most gâteaux have the same shape and consistency as Polish-Lithuanian šakočiai, but some will also display the characteristic layering and thickness of baumkuchen. Also known as prügelkrapfen. This variant is a specialty of Tyrol, on the western arm of Austria. The word prügel originally meant "big stick," referring to the spit that the cake was baked on; over time it has come to specifically refer to the Austrian style. The authoritative recipe is equal parts (by mass) fresh butter, sugar, eggs, and flour. Nothing else! This spitcake from Scania (southern Sweden) translates to, you guessed it, "spit cake." It's made with a thick potato-flour batter, deposited using a piping bag. This gives the finished product some semblance of a fairground funnel cake, or possibly a Jackson Pollock painting. Scanian spitcake also uses lots of egg whites beaten stiff, so this cake is much airier than all other rotisserie cakes. It's like a meringue! These are sweet yeast-leavened cakes, many centuries older than tree cakes. The English name for this group is a direct translation from the Hungarian kürtőskalács. After baking, the steam rising from the top evokes images of a smokey chimney. 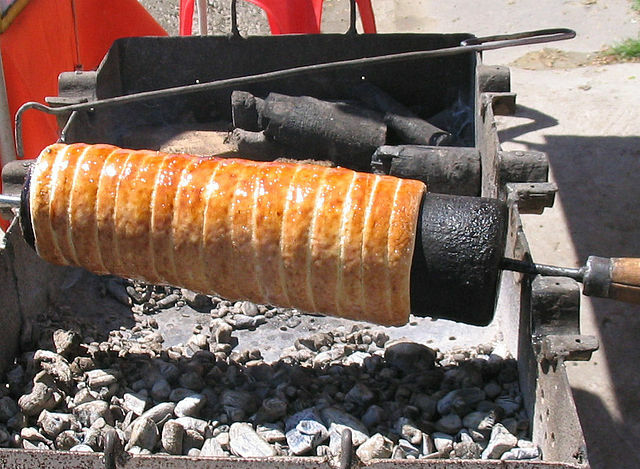 Most people seem to agree that the iconic chimney cake originated in Székelyföld, an ethnically Hungarian region within Romania. However, it flourished throughout eastern Europe, particularly Slovakia, the Czech Republic, and Hungary. The yeast-raised dough is rolled into a long ribbon that is wrapped around a wooden spit, forming a tapered helix. This gets dusted in sugar before baking, to produce a thin, crunchy caramel layer. As the cake bakes, the chef may brush on several applications of butter for a nicer exterior. 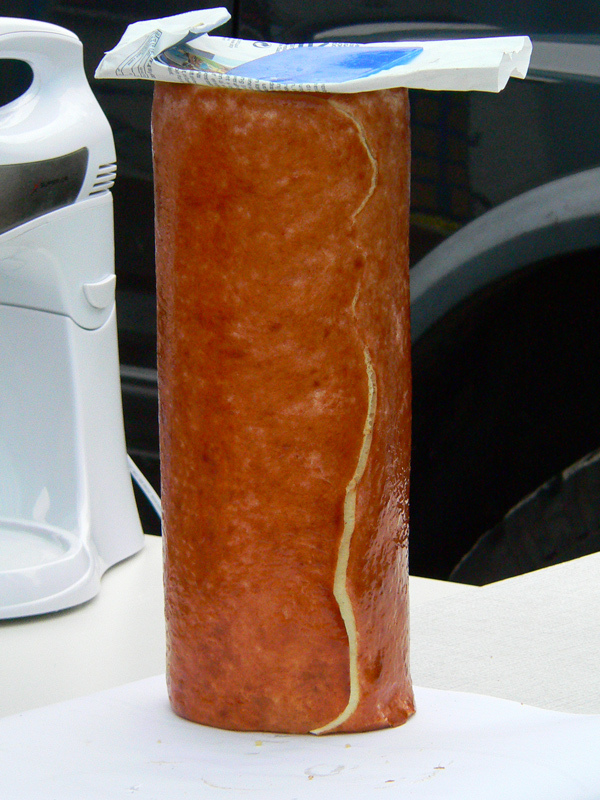 Bakers brought kürtőskalács to all reaches of the Austro-Hungarian empire. It became a particularly popular item in Skalica, in modern-day Slovakia, and spread as a street food throughout Slovakia and the Czech Republic. 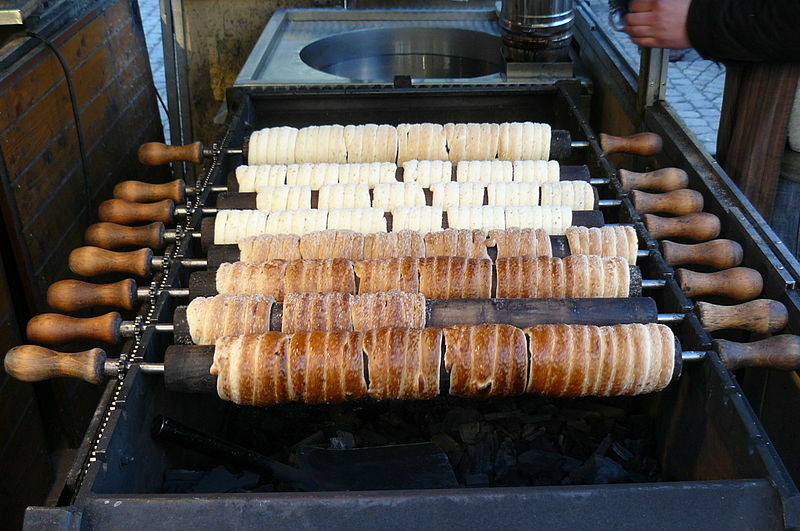 The name trdelník comes from the untapered wooden form (trdlo) that the dough is wrapped on. The dough on the form is usually thicker than the Transylvanian variant, and it gets brushed with an egg wash before baking. The name Baumstriezel is a portmanteau of "baumkuchen" and "striezel," two German cakes that have very little to do with this German cake. It's made in a very similar manner to other chimney cakes, but the dough is wrapped as one big sheet, as opposed to a helical ribbon. It was likely brought to Germany by the Transylvanian Saxon population. 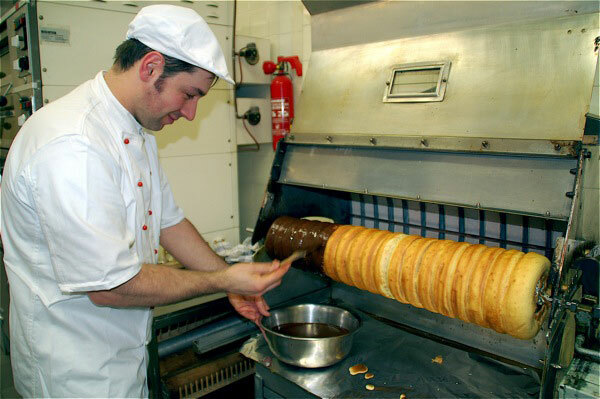 Like kürtőskalács, it is coated in sugar before baking. The following cakes are not part of the rotisserie family, but deserve mention for notable qualities. Possibly derived from spekkoek (below), Kek Lapis Sarawak (Malay for "Sarawak Layer Cake") is without a doubt my favorite cake to look at. Thin, spongey layer cakes are made in all sorts of color and flavor combinations, then they are meticulously sliced and rearranged like millefiore beads. For years, I didn't know the proper name for these. I called them "flatkuchen." This is what happens when you bake baumkuchen batter under a broiler, instead of on a spit. An Indonesian colonial treat. "Spekkoek" is Dutch for "bacon cake," since the layers resemble streaky bacon. It is often flavored with pandan, like many other southeast Asian desserts. 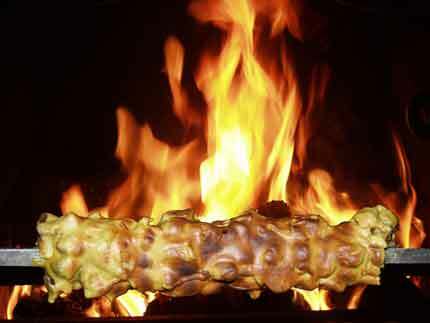 A sweet from 15th-century England, made by threading fruits and nuts onto a string, wrapping the string around a spit, coating in batter and baking by the hearth. This definitely counts as a cake baked in a rotisserie, but I don't know how to properly categorize it. 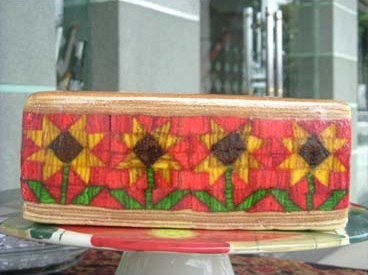 A decorative Kosovar layer cake. 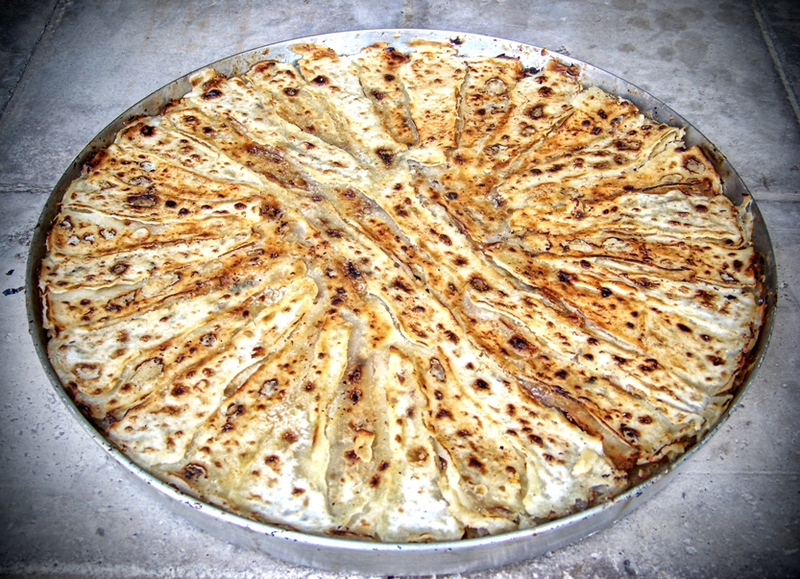 Fresh batter is intentionally dropped unevenly so some parts of each layer get double- or triple-exposed to the broiler.